← A thing of beauty…. Weaver – Mentor – Centaur – Stuck – Stringed Instruments – Healing Humor – Shame – Left and Right Brain – Abandonment – Evolution: just a few of the keywords Joyce Mason uses to unlock the doorway to deep, deep wisdom contained within the archetype of the mythical being known as Chiron: half man, half horse – best known in Western popular culture as the Wounded Healer. Chiron symbolises the deep wound present to a greater or lesser degree in all of us, fallible imperfect creatures, uneasy blends of body and spirit; endlessly curious, forever seeking answers to why we are here and what we are supposed to do with our brief time on Earth. Chiron also symbolises the depth and wisdom we can gain by addressing and seeking to heal that wound, both in ourselves and others. Ultimately, facing and accepting our vulnerability, together with realisation of our inter-connectedness with the whole of life, and the healing power of love: these are our salves and our saviours. Joyce then offers seven “Tips for Not Disowning Yourself” including ‘Listen objectively to things others point out that you’re missing or denying, especially if you hear the same thing from several different people.’ I commend this section to any individual honest enough to be working towards personal growth and change, as well as any therapy practitioner looking for some inspiration to bring to their client work. In Appendix 3, p273, Joyce provides information for people with little or no knowledge of astrology who wish to obtain a copy of their own horoscope and find out where Chiron is placed in their case. The whole book is also filled with useful web and other references to a wonderful range of resources – arising from the core Chironic keyword of Wholeness. The book is of value also to students and practitioners of astrology. From that perspective, this reviewer certainly felt as though she had been comprehensively re- acquainted with the depth and practical value of understanding Chiron’s natal position as well as Chiron transits. 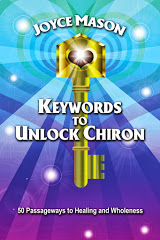 But it is important to stress that Keywords to Unlock Chiron should not be seen primarily as a book for astrologers or those interested specifically in astrology. As per her original book release announcement, Joyce is offering this book in PDF in order to make the material available, at least in some form, sooner rather than later. The announcement describes her book in detail, including contents, other brief reviews and the advantages/disadvantages of the PDF format, including the ways to access it on various reader devices. Due to extensive other commitments, I understand that she may be unable to print it to paperback and eReader (Kindle, Nook, etc.) until 2015. This entry was posted in 02 - New Posts: January 2014 onwards, Astrology Article Archive 1 – "Not the Astrology Column", Book Reviews 2014 and tagged "KEYWORDS TO UNLOCK CHIRON", Centaur, Chiron the Wounded Healer, Joyce Mason, Left and Right Brain, The Radical Virgo, wisdom book. Bookmark the permalink. Hi Anne, This book sounds like it would be a compelling read. Excellent peek you’ve given on what lies inside its pages. A friend who has studied astrology for many years will point out Chiron in charts she has done for me, but not being an astrologer I focus on the summary write ups she provides. I’m so glad to see this ‘wisdom book’ is relevant to all of us. I was especially interested to see you make reference to “The Wounded Healer”. A book by that name, written by Henri Nouwen, was very popular in the 1970s. I’ve read the book, but knew nothing about Chiron (except that it’s a minor asteriod turned comet). These connections that emerge in your posts always amaze me. There are worlds out there whirling around that I know nothing of — some much closer than the outer reaches of space! Well, Linda, making connections across apparently very different disciplines/ways of seeing the world is something I have always loved to do. There are so many metaphors and symbols we can use to explore what are essentially the same underlying realities/archetypes/shaping forces. I look forward to providing you with even more amazement when I have got through all my current RE s: re-habbings (done, with the blog), re-views – now all done, re-publishing of books as e-books – two more to appear, re-visiting Goodreads and managing to get the hang of it. I hope that forward motion come the summer will mean more time to devote to publicising the blog, and books…..still, it all keeps one out of mischief. Enjoy emerging Spring where you are! And many thanks for dropping by.